Creepy pasta is proof of storytellers’ ever-evolving adaptability to new mediums. Nearly everyone has heard of Slender Man, and even if they haven’t learned the character’s name, they have doubtless encountered images, references, and associated myths that have permeated our collective imagination. The Silence in Doctor Who. The Thinman in Supernatural. Faceless, lanky shapes in suits as far as the eye can see. In 2009, a group of inventive tale tellers launched a Photoshop contest on the Something Awful Forum, vying to see who could make the most impressive, scary and believable images. Something Awful user Victor Surge posted the very first images and creepy pastas of Slender Man. And then the phenomenon exploded, sparking a wave of new content from storytellers around the world. Slender Man quickly became more than just another creepy pasta (a unique storytelling phenomenon in and of itself). Slender Man has become a pop culture icon, especially online. There are hundreds of Photoshopped images, fan art renditions, and even videos of Slender Man, and they aren’t limited to niche sites like Something Awful Forum. Several vlogs appeared, focused on the Slender Man, featuring “real” characters who typically launched their vlogs for other purposes. 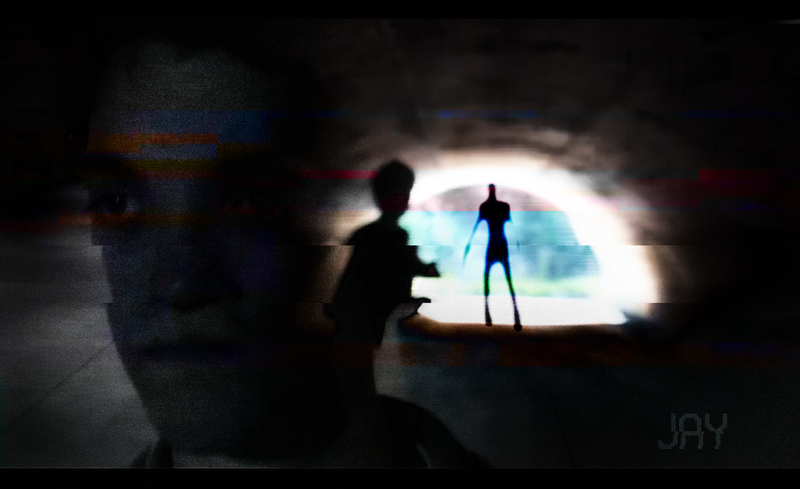 Marble Hornets, EverymanHybrid, and 12 Tribes all posed as unrelated documentaries of Slender-less projects. And then things got delightfully weird. Video feeds were interrupted by “pranks” and supposed hackers who added footage the characters could not see and/or remember. The stories spread, growing ever more vast and complicated. 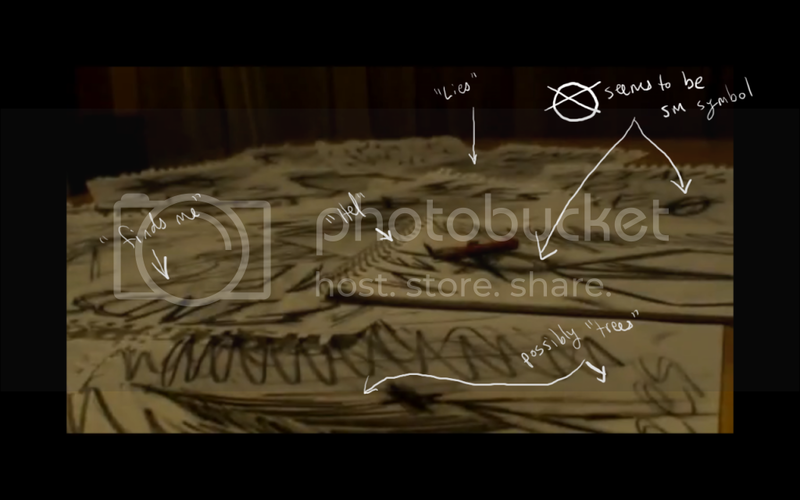 Clues appeared in the vlogs’ linked Twitter and Tumblr feeds with vital clues to the stories’ broken timelines. The videos grew more involved. Riddles, some complicated enough to require proper code-breaking skills, appeared in clips. Challenges doled out to viewers led to a final break with the fourth wall, and some viewers participated in the story by completing missions, recovering hidden clues from given coordinates, and playing along with the “hackers” who periodically claimed various channels’ Twitter feeds. Each vlog had a different story, different riddles, and different artistic choices. Slender Man was their only link, the spark that launched these creative minds into action. Due to the age of the typical creepy pasta fan, the vloggers all used strikingly twenty-first century means to forge their stories. They used the same websites, filming locations, and camera angles they would use in day to day life, things so familiar they were easy to pervert into the bizarre with a few juxtapositioned elements of insanity. And then, of course, there is the game. 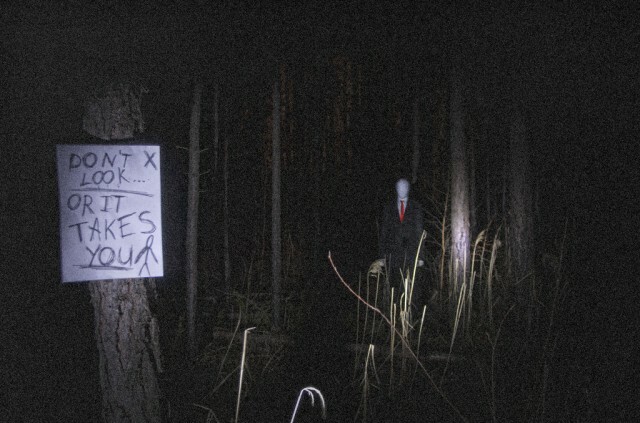 The original Slender video game is almost absurdly simple, but it will live in infamy as one of the funniest ways to traumatize your friends during a sleepover – or, better, a camping trip. Using principle elements of the formative creepy pasta tales, the first person game forces the player to roam a very dark forest, collecting increasingly disturbing notes as the Slender Man hunts. The player must not look at the Slender Man. But the more pages they collect, the faster the Slender Man becomes. This style of game inspired many more horror games that operated on the same basic mechanics. Every discovery increases the danger. Now, the mechanic is effectively trite. The gaming world has exhausted that particular nightmare. But it began with Slender. Once, I found a Slender Man symbol from one of the web series (a circle with a sloppy x through the middle – known as The Operator symbol) scratched inside a movie theater bathroom stall. That was the funniest/worst place to be worried about Slender Man stalking you. I wasn’t sure whether to laugh or cry. Suffice it to say, Slender Man is everywhere. So why is Slender Man so popular? What is so alluring that it would spark such involved projects by so many people? The best place to start is also the most obvious – why is Slender Man scary? That’s what makes the gangly image stick in your mind, after all. The answer is simple, but multi-faceted. Slender Man is a composite of age old horror and the specific fears of the contemporary audience for which it was designed, ranging from our fear of the dark, to the woods, to cyber stalking. Like a monster in a fairytale, Slender Man is most often found in the woods. His sinuous appearance blends into the elongated shadows, allowing him to hide in wait for the lost, the confused, the desperate who have lost the path. But he is also close. Many vloggers and artists show Slender Man inside their homes. First, they see it from a distance, hidden like a macabre Waldo in the background. But soon it is closer. And then it is near enough to touch. And it is too late. That stalking behavior is a key element to Slender Man’s established story-cycle. It watches. It teases. It feeds on your fear and your anxiety. It knows you better than you know yourself. And the stalking isn’t limited to the physical world. Slender Man interferes with electronic devices, appears to distort or add images and footage to instill fear in prey, and sometimes using proxies (humans mentally enslaved to the will of the Slender Man) to hide cameras and clues for the ever-more paranoid subject to discover. This is a very current form of stalking, and combined with the allure and horror of the stranger in the woods, Slender Man offers a potent lure for modern audiences. But it’s more than that. Remember the proxies? In the stories, these are often the most disturbing elements. Slender Man isn’t just another monster under the bed – Slender Man is the devil behind the killer’s cry of “The devil made me do it.” Terror from without is a threat. Terror from within is a nightmare. Terror of what lurks in the shadows – both within and without – is Slender Man’s appeal. Born from a genre unique to the online experience, Slender Man has emerged as a muse for the internet generations. Due to the timing of its creation, inspired creators used new platforms, programs, and methods of storytelling to deliver a new kind of horror. And rather than fading away as another quick meme, Slender Man has become a staple of online pop culture. And is it any wonder? After all, everyone can identify with the faceless.